The other week, Maus came into the study and said “I feel like a date pillow”. As I am sure you all know by now, Maus’ wish is my command. Fast forward two weeks and I say to Maus, “I am going to make a date slice”, to which she replied, “Why?”. “Because you bloody well wanted one”, I replied. There was no comprehension on her face and, to be honest, no enthusiasm. I was not to be deterred. I LOVE finding a use for food that is left over from some other endeavour. The recipe actually calls for dates but I had date paste and was going to use it. Date paste is just dates cooked and mashed up. It makes making the filling a bit less effort. You can buy date paste at Middle Eastern grocery stores. It is sold for making ma’mools. I found this recipe at Allrecipes Australia. Here is the link to the original recipe. *The original recipe called for ½ cup sugar to be added to the filling. This seemed a lot to me (dates are very sweet) so I decided to add the sugar, a little bit at a time, after the dates, water and lemon juice were amalgamated. As it turned out, I didn’t end up adding any sugar. The dates were sweet enough. Cook your dates and then taste. If you think it needs sugar (I would be surprised), add up to ½ a cup. Line a slice tin (mine is 27.3cm x 17.5cm) with baking paper. Put the butter and sugar in a bowl and heat in microwave until the butter has melted. Add the milk and the egg that has been well beaten. Divide the dough in half. Roll out one half and line your slice tin with it. Spread the filling over the pastry. Roll out the second half of the dough and place on top of the date filling. Brush top with milk and prick pastry top with fork. Bake in preheated oven until golden (about 20-30 mins). **If using dates rather than date paste, a friend suggested putting the dates, water and lemon juice in a food processor before cooking them. I think this is a good idea. I found I had bits of date debris in my biscuits so, whether you use date paste or dates, you may wish to sieve the mixture after cooking it to make sure no bits make it into your biscuits. This entry was posted in Biscuits & Slices, Sweet Things and tagged Date pillows by Glenda. Bookmark the permalink. Hi Moya, Date slice is popular your way but John has never seen or tasted date slice. It is funny how that happens. They were popular in Australia but probably a little old fashion now. Still taste great. I’ve never tasted nor seen a date slice, Glenda. Reading this post, I think I’ve been missing out on something really special. Hi John. It is interesting how a sweet can be popular in one culture but not in another. 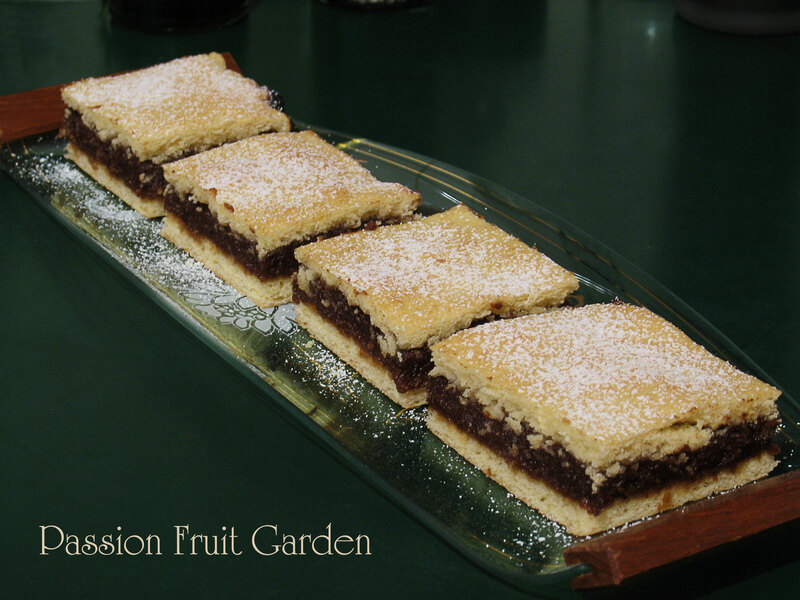 Date slice used to be very popular in Australia but is a bit old fashioned at the moment. It is sure to make a comeback. Oh my, I have not had a date slice forever. Fabulous. Well, I’ve had cravings for things and then a few days later not so much so I get it. But you really did come through & these look great. I don’t think I’ve ever heard them called that before but now I’m racking my brain trying to think of what we call them. It’ll come to me – maybe a few days from now when I’m not thinking of it. Date Pillows? Never heard of them. You are sending me off to google these. Always something new to learn. These slices look delicious. Debi, you will find plenty of images. Yum! I’ve never eaten homemade date slice but have fond memories of bakery date slice from my country upbringing… and Arnotts date pillows were also a staple with smoko. Good food memories. Hi Ella, Food tastes ‘the best’ in memories.